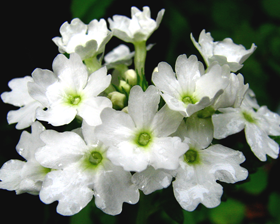 Clusters of snow-white flowers amongst fine spreading foliage, ideal for baskets or as ground cover. Sow February to April. Sow in pots or trays of moist seed compost. Do not cover the seed. Place in a propagator or warm place, and keep at a constant temperature of between 24-27C. Germination will usually take 14 to 21 days. Keep the compost on the dry side at all times, and water lightly as seedlings emerge.